A high fever or severe infection can produce hair loss, as can an overactive or underactive thyroid gland. Other causes of hair loss include an inadequate amount of protein in your diet, iron deficiency, or cancer treatment. Certain prescription medications—such as those for gout, arthritis, depression, heart disease, or high blood pressure—can cause hair loss in some people. Large doses of vitamin A also can cause hair loss. If you notice that your hair is falling out in large amounts after you brush or comb your hair, see your doctor as soon as possible to determine the cause. For men, the most common type of hair loss is male pattern baldness, in which hair sheds from the top of the scalp and the hairline at the same time. Most men will experience some degree of hair loss as they get older. Thinning hair and baldness in men are usually inherited. Hair loss can be treated and controlled. Some men compensate for their hair loss by styling their hair differently or by wearing hairpieces, but there are now a number of effective methods for treating male pattern baldness. 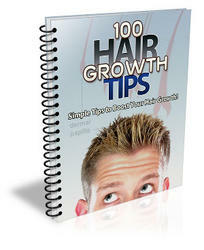 A nonprescription medication called minoxidil is somewhat effective for regrowing lost hair. The drug does not produce results right away, but after about 4 to 6 months you may be able to see soft, downy hair in the bald areas of your scalp. The new hair may become the same color and thickness as your existing hair. Minoxidil is not effective for treating hair loss caused by anything other than hereditary male pattern baldness. If you stop using the drug, the hair loss will begin again. 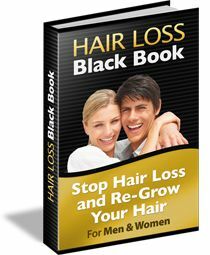 Hair replacement surgery (see page 442) can restore lost hair.